„Nein. Neinein“, sagte er: „Davon kann gar keine Rede sein, daß man abends wieder am Ausgangspunkt wäre. Das ist sogar…eine ziemlich komplizierte Angelegenheit… Zuerst ginge man nach Osten. Dann nach Süden ausholend…Dann, im Laufe des Nachmittags, Süd-West…und schließlich nach Westen: immer der Sonn’ entgegen“. in: Werke. Bargfelder Ausgabe. I/3, S. 293-311.
erstmals erschienen in dem Band "Kühe in Halbtrauer", Stahlberg Verlag, Karlsruhe 1964. From a point on the Earth, a walker starts at sunrise, walking at a constant speed always in the direction of the Sun, and ending at sunset. What is the path ? Bargfeld (Germany, 52.7039° N, 10.3459° E) was the residence of Arno Schmidt (*1914, +1979). Opening this page the applet is showing the complete path from sunrise to sunset. To walk stepwise, press the button "Clear", and then press the key "+": The time will increase by 1 minute. Pressing the key "h", the time will increase by 1 hour. 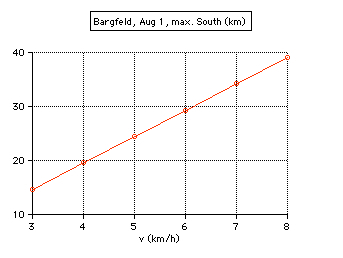 The speed is preset to v=5 km/h, and can be changed. Use the keys d, or m to increase the date, or month. Select from the menu to change the speed v, or the time step dT. Select "Positions on/off" from the menu to draw the position at every hour after sunrise. The calculation is performed step by step, using the time interval selected. For sunrise and sunset the refraction of light is taken into account, as well as the (small) change of the declination during the walk. There is a small difference between the curves for the step size dT=1 min and dT=10 min. 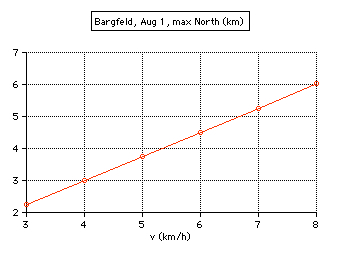 At Bargfeld, on August 1, the total path length is 77.83 km, walking v=5 km/h. 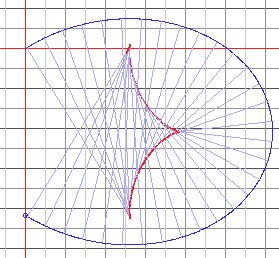 The evolute of a given curve is the envelope of the normals to it. This can also be thought of as the locus of the centres of curvature. The evolute of a circle would be it's center. 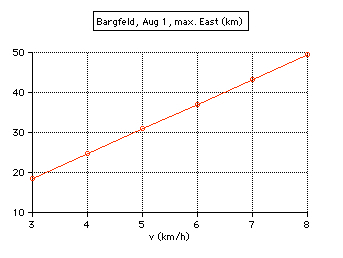 The evolute (red curve) at Bargfeld on August 1. Choose "Evolute from the "Select" menu. Jean Meeus: Pursuing the Sun. Die Werke des ebenso bedeutenden wie eigenwilligen Schriftstellers sind voller Wortspiele, Andeutungen und Hinweise auf astronomische Themen. In: Sterne und Weltraum, 8/2007, Seite 48-54.
astronomisches Problem, gestellt von Arno Schmidt. Didaktik Math. 20 (1992), 89-111. Wolfgang Müller: Der Lösung entgegen - Arno Schmidts "Wanderkurve" in erster Annäherung. Bargfelder Bote, Materialien zum Werk Arno Schmidts, Lfg. 89-90/April 1985, S. 12-23. Ulrich Goerdten: Arno Schmidts 'Ländliche Erzählungen'. Sechs Interpretationen, Bangert & Metzler 2011, ISBN 978-3-924147-63-1. Gemeinschaftsleistung unserers Kontinentes, den Venusdurchgang von 1769.